CIFASD investigators examined whether changes in the levels of circulating microRNAs (miRNAs) in mother’s plasma during pregnancy could work as a biomarker for Fetal Alcohol Spectrum Disorders (FASD) in the developing fetus. They identified 11 miRNAs that were significantly elevated in mothers who delivered infants with evidence of FASD compared to mothers who consumed similar amounts of alcohol in pregnancy and had infants without any evidence of FASD and compared to mothers who drank little or no alcohol in pregnancy. These findings suggest that maternal plasma miRNAs may be a useful and very early biomarker for FASD. Early intervention is known to improve outcomes for children with FASD. If miRNA measures in mothers during pregnancy can aid with early identification of affected children, this can help to improve outcomes. 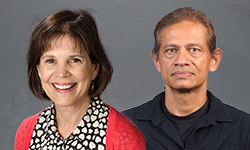 CIFASD investigators, Drs. Christina Chambers, Julie Kable, and Claire Coles, found that measuring heart rate responses to stimuli (the cardiac orienting response) in infants at 6 months of age was better than the Bayley’s test of development in predicting both normal and impaired infant performance at 12 months of age. The COR, a simple test requiring few resources and minimal expertise to administer, may be an effective early measure of alcohol-related impairment in young infants. This novel screening tool could provide an early, and more accessible method for early identification leading to better outcomes for children with FASD.